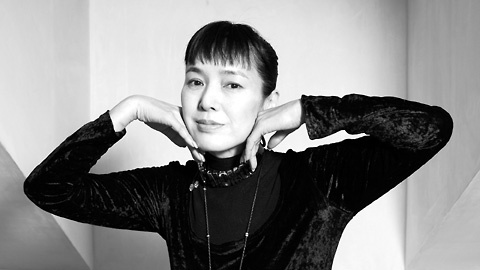 Debuting in the early 1970s, actress Kaori Momoi has had a career that sounds like the envy of many a Japanese thespian. By the dawn of the 1980s she had worked with the likes of Akira Kurosawa, Shohei Imamura, and Yoji Yamada, and even in the new millennium she shows no sign of slowing down or of compromise: her recent filmography includes eyecatching turns in Takashi Miike's Sukiyaki Western Django and Izo, Aleksandr Sokurov's The Sun, and the American remake of Yamada's The Yellow Handkerchief (after previously starring in the 1977 original). In 2006, Momoi made her own long-hoped-for debut as a director with the idiosyncratic family drama Faces of a Fig Tree. What are the origins of your film? Faces of a Fig Tree is adapted from short novels that I wrote at the age of 27. The script is like a condensed version of those. I started writing short novels and essays professionally at the age of 22. I wrote a long novel 10 years ago, which was such a big failure that I decided to stick to short novels! (Laughs) I wrote the script of the film in only one day; I sat down and wrote it all between 10 am and 5 pm. Everybody told me: "Wow, it must have been so tough for you!" But it was not that tough; neither was the shooting. In fact, editing the film must have been the hardest part for me. Had you turned your hands to directing before? Actually, yes. I had directed, among other things, episodes of TV series. But until the age of 50, my name was always hidden. In Japan, actors and actresses who turn to directing are ill seen. They're seen as overly presumptuous people. Especially women. They are even more harshly dealt with. So, given that I was already considered arrogant as an actress, I decided to keep my name off the credits when I started directing. Later, I said to a producer that I did not want to direct anymore, just write scripts in anonymity. But when I was offered the opportunity to direct my first feature, I jumped at the chance and decided to go all out. You break the rules of filmmaking with great relish in your film. Is it someting you considered doing from long ago? I had felt that, as an actress, I was always a toy in the hands of directors. Furthermore, the experience of acting always entails precise rules; very often, the director or his assistant will say: "Look to the right, to the left, look here, don't look into the camera," etc. I have been an actress for 37 years now and I have always wondered why it was impossible to look straight into the camera. Why does the eye of the actor always avoid the camera? Why not film reverse angle shots where actors look directly into the camera as if it were their counterpart? That is why I decided to do just that in my film. When you film in a traditional way, very often a seasoned audience can guess what the next shot will be. It's boring. I decided I did not want to use the old tricks of movie-making, which I know from acting. But since I did not want to upset the audience too much, I polished the lighting, colors, and sets as much as possible. My cameraman wasn't too happy; he told me that my reverse angles were odd and incorrect, that the shots did not assemble well. But it felt normal to me since I wanted to make something different and fresh. I felt like a beginner willing to shake everything up. One director criticized me for doing "forbidden things". But there are no taboos for me; just rules to be broken. Also, I did not set out to make a "beautiful" or "decent" film. For me, filmmaking is but a means of achieving things that one cannot achieve with either literature or music. What did you want to express through the character of this domestic mother and her strange mirror-like relationship with this fig tree, which seems to yield nothing while watching over everyone? I intentionally created a female character that is quite stereotypical. She belongs to the old Japan. When her husband comes back home, she welcomes him politely by saying "Okaeri nasai". She always waits for her husband before eating dinner. This kind of woman does not really exist anymore in Japan nowadays. The fig tree is like the symbol of this woman, as a wife and mother. Also, this woman's memories are linked to this tree, it is like her mirror. Through this I wanted to express the great endurance of women in daily life. I have always felt like that about women. They are not that fragile, but they think they are and tend to think that they cannot live without a husband, or else they will be on the losing side of life. It's like an atavistic way of thinking with women. But they are much stronger than they think they are. When my character's husband is away from home, she begins to imagine herself living without him; everyday, it's like the simulation of a husbandless life for her. So that's why she can go on living almost normally after the death of her husband. I think my film confirms the doubts I had about the young generations nowadays, what I read about them in the newspapers. It's interesting to note that the young actress who plays my daughter thought that her character was not "emotional" enough. She thought this girl lacked willpower, energy, and agressiveness, and that, in this regard, she felt like a girl of nowadays. Maybe what was most new to me with this film was that, through this young actress, I became conscious of how topical such a character is in Japanese society. Maybe I really became conscious of the fact that a new generation, quite different from mine, had been born and exists now in Japan.